It is a year now since that unforgettable day, when artisanal miners, deep in the hills of Kitumbi sub-county, Mubende district, were evicted by a combine force of soldiers and police from the gold mines following a mere two-hour ultimatum to vacate immediately. Property worth billions of shillings, including equipment and cash were lost in the pandemonium as the miners were destined hapless situations. To-date, many of the nearly 60,000 affected people have not fully recovered. While some have moved to the nearby districts of Mubende, Mityana and Kibaale, or returned to the city to etch a living, many are still stuck deep in the villages of Bukuya Sub-County or Kassanda, either awaiting news of their fate as regards returning to the mines or forging a new life. In March this year, a team from ActionnAid Uganda-in the Extractives Governance Project met Kicucula village miners in their hundreds who had sought refuge there. They had walked 19 kilometers from the mines in Kitumbi in the hope of working at Kisita gold mines. Unfortunately, the area is not accessible as there is an already licensed mining company. They told sad stories of how they were hopeless and desperate. They had nowhere to begin and many said they could not return home to nothing, with nothing. Prior to the evictions however, many of the miners had joined or formed associations following incessant advice from different stakeholders that it was the only way they had a chance of being recognized and respected by the powers that be as well as having the hope of returning to the mines and work in an organized manner. As the miners came to terms with what had befallen them, they started convening meetings with the coordination and support of ActionAid Uganda (among other stakeholders). At these meetings, miners recounted the horrors of that day, they told stories of anguish and poverty as they sought answers from their local leaders. They also served as times for reflection and appreciating their situation. At one such meeting in Mityana town they turned hostile towards the Ag. Director of Geological Survey and Mines, Mr. Zackary Baguma whom they accused of malignity. However, they were only calmed by the State Minister for Mineral Development, Hon. Peter Lokeris, who promised to deliver their pleas to the head of state. In the face of desperation, anguish, uncertainty and what appears to be well orchestrated power play by certain individuals to kick the miners out, however, a steadfast leadership of patiently determined representatives for the aggrieved miners that is relentlessly engaging the powers that, be has emerged. Mr. John Bosco Bukyanagandi, a spokesperson for the Ssingo Artisanal and Small Scale Miners' Association (SSASMA) and Mr. Emmanuel Kibirige, the secretary of the same association have been in and out of power corridors and engaged whichever power player to advance the miners' concerns. Currently they have enlisted a consultant to offer counsel on their course of action. SSASMA is one of the twenty-one registered associations under an umbrella social movement, the Mubende United Miners Association (MUMA) whose Chairperson is Bukyanagandi. Under MUMA, the miners' representatives met the president in a grueling meeting to reach a middle ground for the miners to return to work. The area where the miners were evicted from is licensed to AUC mining Company Limited. Mr. Ivan Kawuma, a miner who attended the meeting said of AUC's Moses Masagazi: "We have negotiated with the man but he's not easy. Even his business partner Ms. Gertrude Njuba tried to convince him to let us work and they buy the gold he refused. He also flatly said no to the president." Following hard line negotiations in which the proprietors of AUC Mining Company seemed unfettered even in front of the president, the latter eventually prevailed and directed the company to relinquish 30% of their area to the miners. This moreover was after the miners successfully protested an offer of unexplored 10 square kilometers allocated to them in Kabweyakiza village, Madudu Sub County. They argued that the area had no gold and that it was a ploy to subdue them and condemn them to poverty. It is months since the president made that directive upon which the directorate of geological survey and mines is supposed to process location licenses in Kitumbi for the ASMs. However, the miners' patience is being stretched with blame being seesawed between DGSM and ministry officials, power brokers, AUC Mining Company officials and a rival miners' associations. 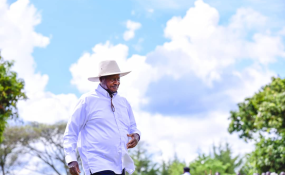 When the president directed that AUC Mining Company relinquishes the 30%, the letter was shockingly recognizing Federation of Artisanal Miners' Associations of Uganda instead of MUMA. Shockingly among the 13-member Federation executives some prominent members also applied for location licenses for three registered associations under MUMA. The miners are gutted and distraught. "When we went to the registrar of companies to find out who was behind it we were shocked to find names of people we were relying on to fight for our cause," said Kibirige in disbelief. MUMA executives protested and complained to the president and ministry officials that they were not the Federation which was being seen as trying to hijack their opportunity. Unable to do much about it the miners "grudgingly accepted to divide the 30% in half," according to Bukyanagandi. In between attending several meetings with AUC Mining Company officials, the Federation and ministry officials on how to proceed in light of the new arrangement (a site visit is to be conducted in the mines to agree on where the proprietor will relinquish) leading to further delays.I It also emerged that there are some heavy weights in government behind the Federation. None the less, the unwavering MUMA executives managed to secure audience with the the head of Operation Wealth Creation (General Salim Saleh) on August 20, 2018. At a meeting held at Serene Hotel, Mutundwe that the miners described as very promising, General Saleh is reported to have said: "Yes I know those people of the federation but I sent them to do some organisation." Speaking about the meeting, Bukyanagandi said: "Now that we are talking to the right people there is hope." General Salim Saleh is reported to have told the MUMA representatives that he had their interests at heart and his clear instructions to his people were that they cooperate with you in an organized manner because "you must go back to work." The MUMA executives expressed their frustrations to General Saleh and prominent among them was the somewhat clear sabotage by the federation outfit, which he also works with. But the General denied and promised to organize a meeting between "his people" and MUMA. "I want you to hear from them what I instructed them to do. I want you to accuse them in front of me," the cordial Saleh is reported to have said. Meanwhile, the mines in Mubende are off limits and under the control of the Mineral Police Unit which was formed following the evictions. However reports are rife that there is illegal mining taking place under the cover of darkness. A private broadcaster, NTV, carried out a well-executed investigation into the illegal mining reportedly being carried out by 'connected people' and those in security circles. The camera crew managed to gain access to the mines under-cover as some of the few miners that work in the night after paying bribes to those in charge. The ore is reportedly extracted from the mines but processed somewhere else to thwart any suspicion. The documentary clearly exposed the unbecoming situation unfolding in the mining areas and the mineral protection police were deeply angered by the production of the documentary. Amidst all the tossing back and forth by concerned officials, the artisanal miners' leadership has been unrelenting. Kibirige narrated how they went up to the Prime Minister's office wielding a letter from the Justice and constitutional Affairs Minister advising that all government officials dealing with the miners' issue would be personally held accountable for their actions if the presidents' orders were not effected to the letter. The Prime Minister in turn wrote to the responsible office instructing that the matter be put to rest once and for all. Late June this year, AAU hosted an exchange and learning workshop for mining stakeholders drawn from Uganda, South Africa, Zambia, Zimbabwe, Kenya, Malawi and DRC under the auspices of the Africa Extractives Working Group. The highlight of the workshop was a case study of the South African mining movements of MACUA and WAMUA. Activists from especially South Africa (including Sifiso Dladla, Meshack Mbangula and Lorraine Kakaze among others) took turns sharing their experiences of how the now formidable movements came into existence. Their sole purpose is to rally mining affected communities against marginalization through unfair government policies and exploitation by multi-national corporations. Today a mining project cannot start in South Africa without comprehensive consultation process with the communities and well laid out MoUs. Immediately after the regional meeting, a specifically targeted sensitization, mobilization and training workshop was organized and held (with the support of AAU) in Busia for the ASMs from different areas including Busia, Namayingo, Karamoja and Central region. They were enabled to appreciate their potential and how the African Mining Vision can be of help to protect their rights and guarantee realization of durable benefits from the exploitation of natural resources. MUMA has drawn lessons from the above processes and they are positioning themselves as advocates for miners' rights. The group has also taken the mobilization and organization of ASMs beyond Mubende but to the national level by rallying their colleagues from other parts of Uganda (including Western, Eastern and Karamoja). They were thus able to organize and hold a national convention for ASMs in Uganda on 7th September 2018 at Hotel Africana (with the support of AAU). They draw from rich experience owing to what befell them a year ago and have severally been advised that without a common voice and better organization they will not get audience and durable recognition. Bukyanaandi said of their struggles for inclusion and legalization: "We are making headway. Previously we were regarded illegal and disorganized; now government is inviting us to meetings and engaging us as ASMs. However the struggle continues since we are not yet back to work."